Right after I hit publish on my post yesterday, I stumbled across #Blogtober, a challenge in which bloggers attempt to write every day during October. Well, I know me and you know me, and we all know that this probably isn't going to happen, but I'm going to do my best to use this as an opportunity to get back into the habit of writing often. Apparently this past weekend was the last one of September. Who knew? I don't even feel like September happened. Seriously, if it wasn't for our anniversary, I don't think I'd believe that it really happened. I spent much of the weekend with an ice pack attached to my arm because I got stung by a hornet or something last Wednesday -- it's still not quite healed yet. I know that the weekend didn't really start Thursday, but Friday was one of Bill's Fridays off. He gets every other Friday off because he works an extra hour each day. It's a great perk of his job, especially since Haddie was born. We started our long weekend with dinner at Sakuramen with my cousin Nick! He was in town for a conference. It was great to catch up with him! Ramen is something Bill and I both love but that we have been hesitant to try since having Haddie -- it's really crowded, a little hot & stuffy, and we were worried about her being around the hot broth, but it all went fine. She was literally a perfect angel and just sat smiling in her carseat the whole time. We didn't really do very much on Friday. Bill took the the car into the shop in the morning and learned that we had to replace all 4 tires. A fun expense we weren't expecting. We spent the rest of the day just hanging out and relaxing. We ordered Chinese for dinner (which we used to do all the time, but now it's a rare treat), played a game of Scrabble (I lost) and then watched a couple episodes of Ozark before bed. Saturday morning, Haddie and I headed into the city for a baby food event with Raised Real. Because we hadn't gotten the new tires on the car yet, we took the train. It was her very first train ride! I've been nervous about taking her on the metro, but she did great and it wasn't as hard to navigate the stroller as I thought it might be. We then had to walk about 10 blocks to the event and it was hot out so I was struggling. It happened to be National Coffee Day, so I grabbed some Starbucks even though I was hot and it was delish. 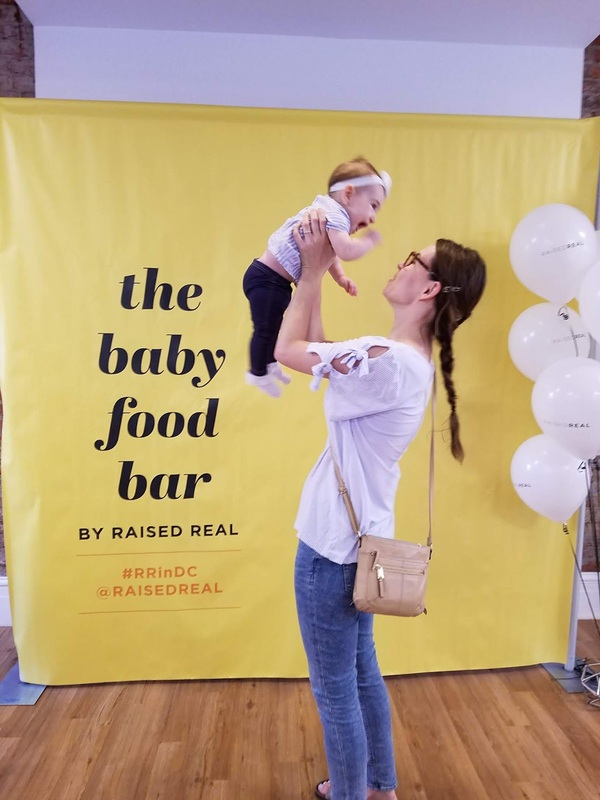 The event itself was ok -- the company makes bags of pre-cut frozen meals for babies. All you have to do is steam and blend them. I was pretty excited to try the food, but it wasn't really that tasty to me or Haddie. There were some odd ingredients. I think we'll just stick to our basic recipes! There was a play area where she met a couple new friends and we took some pics. Then it was back out into the heat for the trek back home. All in all, it was fun to get out of the house and into the city, but not sure it was worth the metro commute. I ended up with a migraine for most of the rest of the day, so that sucked, but I whipped up one of my mom's easy dishes for dinner, which my family calls Choo-Choo Wheels. Not even totally sure why - guessing because you use wheel-shaped pasta, my little brother called it that? Anyways it's pasta wheels with ground beef cooked with onion, tomato sauce, ketchup, garlic salt, Italian seasoning, and Parmesan cheese (which I left off mine since I'm dairy free at the moment). It was the perfect comfort food! I woke up feeling much better and it's a good thing because I had shopping to do! There's a sale near us called The Wee Sale and it's a semi-annual kids consignment sale. I had gone to the sale on Wednesday for the new mom shop and got some good stuff, but I really struck gold on Sunday which was the 50% off sale. I got there around 9 and shopped for nearly 3 hours. I had sooo much stuff in bags that I sorted through and pared down. I ended up with the following: 21 shirts and dresses, 5 pairs of pants, 4 coats/jackets (including a beautiful fur winter coat, red pea coat, a really good quality jeans jacket, and a raincoat), 2 sleepers, her Halloween costume, 6 parenting books, 2 baby books, a tugboat toy for the bath, 2 brand new glass bottles, a Infantino baby carrier, and a bag full of babyproofing stuff for the house, all for $107. 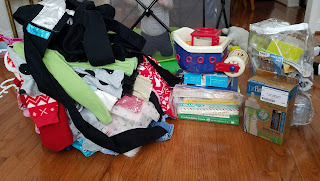 I didn't add up all the stuff I got on Wednesday, but I got a babyfood maker, tons of long-sleeved onesies, sweatpants, outfits, 3 Halo sleep sacks, a beautiful brand new dress that we might use for her baptism, 2 vests, and more! I never have been into thrifting or used clothes, but I really love this particular sale. 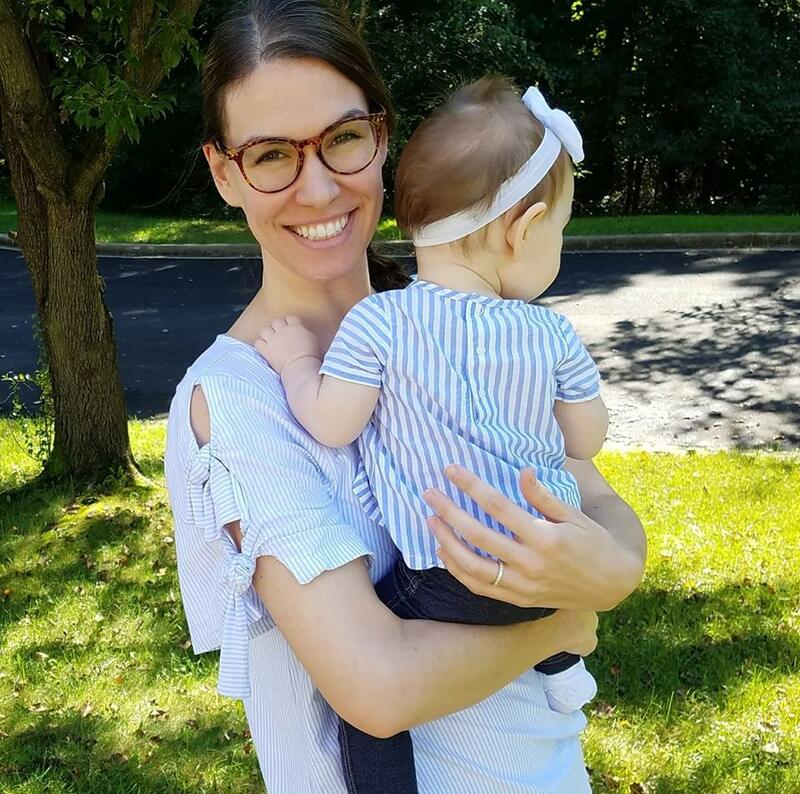 Many of the moms shopping are the people who consigned their clothes there and they screen the items so you know you're not getting things that are too old or worn. 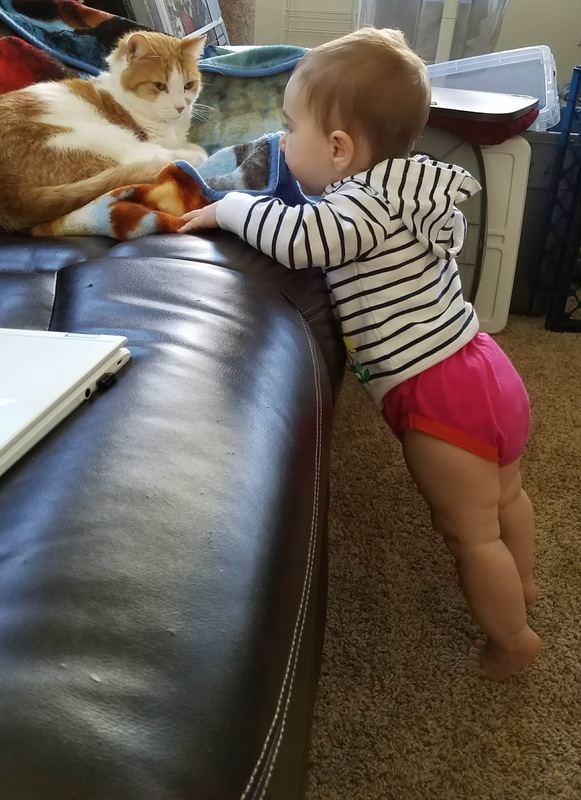 Babies grow out of things so quickly that it really helps to buy used. I can't remember what else we did on Sunday, but I was pretty exhausted from the sale. This weekend, Haddie had her first cold. Luckily the worst of it only lasted 24 hours but it was so sad to see her struggling to breathe, especially while she nursed. She had a fever and her eyes were all red. She was croupy and sounded hoarse, but like I said, she got better fast! She started pulling herself up and standing this weekend! Not sure I'm ready for that yet, haha.